Here at TurnoverBnB, we simplify vacation rental cleaning by helping short-term rental hosts with turnovers by offering hosts free software to schedule their cleaners. 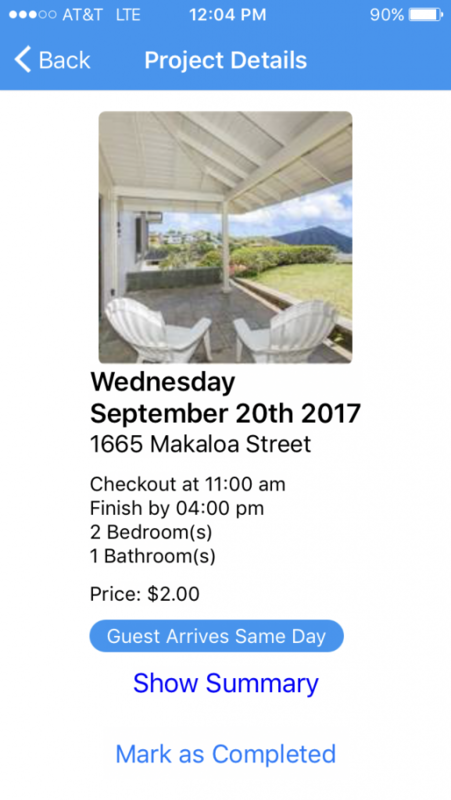 Our free vacation rental cleaning software has been live since June and we have many hosts on our system enjoying headache-free scheduling for their Airbnb and Homeaway short-term rental properties. At TurnoverBnB, we are always looking for new and exciting ways to improve our system and we are happy to announce a new feature. As a host, your cleaner now has the ability to notify you when they have completed a scheduled project. After the project is completed, the cleaner has a ‘project complete’ button they can click on either the web app or mobile app. Once the cleaner clicks the project complete button, hosts will receive a notification on the web app that their project has been completed. In the future, we will give hosts the ability to receive an email that the cleaning project has been completed. As a host, if you want to use our new project completion feature, make sure to have your cleaner update their mobile app, which includes the new ‘project completed’ button. The cleaner version of our web app already has this feature. We have many other new features to enhance our vacation rental cleaning software that will be released soon. In the near future, we will release an optional auto-pay your cleaner feature, which we are really excited about. A host will enter their payment (i.e. credit card) information and the cleaner will be automatically paid 24 hours after completion of the cleaning project. The 24-hour window allows hosts to cancel payment for any reason. We hope you guys are enjoying our platform! Since we’re a free tool, we don’t spend any money on advertising – so if you find value in our service, make sure to tell your friends about us.